Tesla 2025 bonds fell on Friday to an all-time low. "It's the bondholders who matter, not the stockholders, and the bonds keep going down," CNBC's Jim Cramer. Chief accounting officer Dave Morton resigned after just a month with the company. Tesla shares are having their worst day of trading in over two years amid new alarming antics from CEO Elon Musk and executive departures. But the bigger problem for the company may be the trading in its bonds. "It's the bondholders who matter, not the stockholders, and the bonds keep going down," CNBC's Jim Cramer said on "Squawk on the Street." The electric automaker has $9.5 billion in long-term debt as of the end of the June quarter. Credit ratings agency Moody's most recently lowered its outlook on Tesla's situation to negative from stable, citing "significant shortfall" in the Model 3 production rate and a tight financial situation. "I don't even look at the stock anymore, because that's emotional. I look at the 2025 bonds, and I look at it incessantly," Cramer said. Tesla's skeptics have called into question the state of the company's financial position. It lost nearly $2 billion last year, and through the first two quarters this year it has burned through about $1.8 billion in cash after capital investments. The company had $2.2 billion in cash at the end of the June quarter. At Tesla's current cash burn rate, Canaccord Genuity said in a report Aug. 8, the company has only enough cash to sustain itself for "another six to nine months." 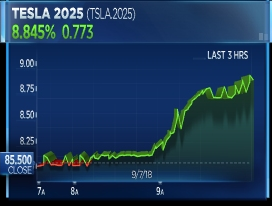 "When you see something that's 83.25, that's the chief accounting officer leaving," Cramer said of Tesla's bond price. Chief accounting officer Dave Morton resigned after just a month with the company, citing "the level of public attention placed on the company," the carmaker said Friday in an 8K filing. "The chief accounting officer who leaves is such a red flag," Cramer said. Morton's exit follows Musk's interview with Joe Rogan in which he smokes weed and drinks whiskey. The Tesla 2025 bonds represent $1.8 billion of Tesla's debt load. The rising yield and falling price of the bonds imply the company is at a greater risk of default, especially as concerns grow that Tesla may need to raise funds. The market's faith in Musk's ability to raise cash if needed has kept Tesla's implied risk of default lower than similarly rated junk bonds and has propped up the price of its debt, according to analysts. — CNBC's Fred Imbert and Tae Kim contributed to this report.